King of the heavy duty markets in Australia, Kenworth, has unveiled a new ‘king of cabs with its ‘giant’ 1400mm aero roof sleeper for its T610 model, completing the T610 sleeper cab line up. Kenworth has progressively released application-engineered T610 cab configurations since the introduction of the T610 and T610SAR in early 2017, including the day cab, 860mm aero, 760mm mid-roof, and most recently the 600mm aero sleeper which offers room for both a sleeper and a bullbar in combination with full-length 34 pallet trailer sets within the 26m B-double envelope. According to Kenworth the new T610 1400 mm sleeper means the T610 range now provides Australian operators the broadest choice of purpose-built cabs and sleepers for their needs. The company says the T610 1400mm sleeper option is suitable for a range of applications from single trailers to road trains and has been designed and engineered here for Australia’s unique regulations and conditions. 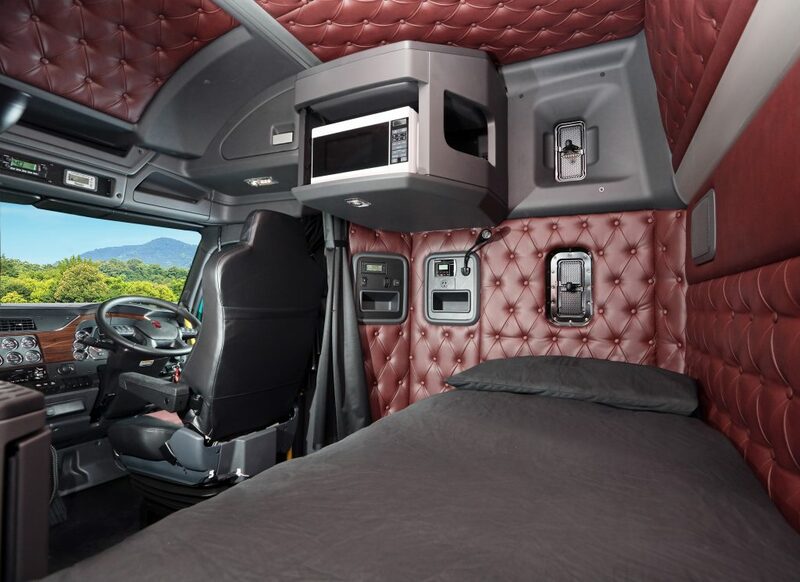 The new sleeper comes with even more interior space and in-cab standing room than its 50” predecessor offering enhanced driver comfort, space and flexibility in fit-out, the most spacious sleeper in the Kenworth range. The 1400mm sleeper comes with a superior 790mm inner spring mattress as standard and the option of a King single, which is 300mm wider than the standard at 1090mm. The upper bunk option, if selected is 100mm wider than in the 50” cab . Fuel efficiency is critical, so Kenworth spent significant time optimising the shape and surfaces over the sleeper cab roof to improve the aerodynamics while delivering an impressive looking truck for the most discerning of buyers. An optional roof fairing completes the picture for when backed up to maximum height trailers.The result of more than 100,000 Australian design hours and more than ten million kilometres of testing and validation, the T610 has been the single largest investment in product development the company has made in Australia. From idea to reality, this significant investment in new technologies and design is specifically for the Australian road transport market.